Upvc door handles with 95mm centres to suit Millenco or ERA Vectis door locks. The Millenco upvc door handles with 95mm centres are available in White or Gold. 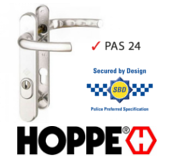 The ERA Vectis door handles are to suit the ERA Vectis door locks only with a standard mortice key, these upvc door handles are available in Lever / Lever or Lever / Moveable Pad and come in a White, polished Brass or Polished Chrome finish.